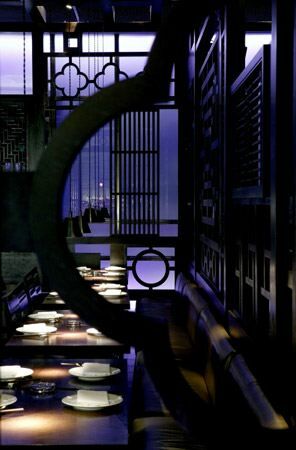 Hakkasan, a nouveau dim sum emporium favored by London's beautiful, trendy set, but despite this, Vincent assured that they also had excellent food. The restaurant is owned and operated by the fellow made wealthy by the Wagamama chain and one gets the sense that this was the restaurant he really wanted to open all along and the cheapo noodlehouse franchise was just a means to an end (though an incredibly lucrative means, it seems). The dining room (downstairs in a hidden basement of a hidden, unmarked building down a hidden alley) is kept midnight dark even at midday. Luckily at lunch the crowd seems to be a bit less poseur-y than it might be at dinner time. Still, there is a strict ban on cameras in the dining room â€“ those supermodels have got t feel that their million dollar visages are safe from the paparazzi (I stole this pic from the web). We ordered from the menu (there are no dim sum carts, of course â€“ how gauche!) choosing a few dim sum items and a couple mains. The dim sum items that one can find anywhere (sticky rice, pork dumplings, etc.) were good, but nothing special, and certainly not as good as the best I've had elsewhere. The few more interesting choices (pumpkin puffs and crispy tofu cheung fun) were far more successful. They were innovative and well-executed, playing with the form to excellent effect. I still find myself wondering how the hell they make those crispy tofu rolls. But the real stars were the dishes we ordered. A stir fry of gai lan was perfectly seasoned and cooked with bright fresh stalks of gai lan and pungent counterpoints of garlic and chilies. And the braised tofu clay pot? Wow. The lovely dark, rich flavor was enough to sell me on the dish, but the texture of the ultrasoft tofu (and how it maintained its integrity in the stew) was a minor miracle. I'd come back just for that (and since lunch came to 120 pounds for the 3 of us, that's probably all I could afford anyway).